DOES SINGAPORE SUMMIT MEAN PEACE IN OUR TIME? For these ten nations to come together, there must be a major upheaval that transforms the nations of the world and their alliances. President Trump may be the catalyst. It’s difficult to know at this point what the outcome of the Singapore summit will be. 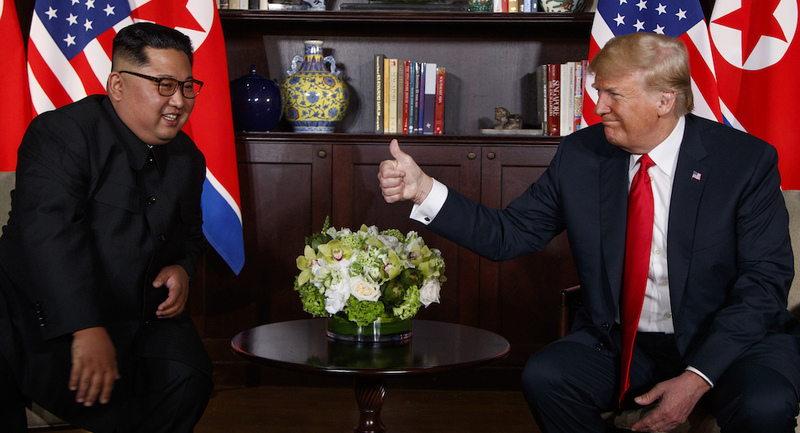 North Korea’s Kim Jong Un and US President Donald Trump seemed to get along fine and there is hope of an end to almost 70 years of conflict on the Korean peninsula. “ . . . To Trump’s credit, we are surely at a better place than we were a year ago when Kim was testing hydrogen bombs and ICBMs, and he and Trump were trading threats and insults in what seemed the prelude to a new Korean War. In 1938, before the word “summit” was used to describe meetings of world leaders (it was first used by Sir Winston Churchill over ten years later), the two most powerful men in the world met in Munich. British Prime Minister Neville Chamberlain and Germany’s leader, Adolf Hitler, worked out a peace “deal” between them. Mr. Chamberlain was able to return to England and proclaim “Peace in our time.” Less than a year later, the two nations were at war. World War Il was to last six years. 80 years later, the Singapore summit has raised hopes of an end to the threat of nuclear war involving North Korea. But whether this will mean peace remains to be seen. Meanwhile, it is becoming clear that neither North Korea nor the United States are the biggest beneficiaries following the summit. The nation that benefits the most is China, already the greatest power in the Far East. “Kim Jong Un flew into Singapore on a Chinese plane for his summit with US President Donald Trump and left with a prized concession long sought by Beijing: the suspension of US-South Korean war games. Not only that, but Trump also teased the possibility of a complete withdrawal of American troops from the Korean Peninsula at some point in the near future. As said on CNN, this statement is exactly what China wants. Under pressure from Beijing, North Korea will likely take a more peaceful course. The country will likely open up to some foreign investment, mostly from China, although there is little prospect of an end to authoritarian, communist rule. China itself has not made any progress in that area. It may take some time for the world to see clearly that this summit was a big step forward for China and Chinese power in the Asia-Pacific region. Perhaps mindful of the decline of the European powers in the region following World War II, China is enabling the US to decline gracefully in what is increasingly a Chinese sphere of influence. Even the summit venue, Singapore, is ethnically Chinese. A friend of mine in the city-state reports an increased sighting of Chinese ships around the strategically important island. PARIS (AFP) – “France is increasing its military presence in the Indo-Pacific region, sending warships through the South China Sea and planning air exercises to help counter China’s military build-up in disputed waters. Around the globe, the talk was of peace; but the summit was largely about money, as is so often the case with global power struggles. Although the US economy is doing well, the country is heavily in debt (more about that later), while China has mountains of cash. Inevitably, the latter is going to overtake the former, at least in Asia, unless things change fast. “Donald Trump’s America-first diplomacy has shaken the foundations of many global institutions and alliances, but its most damaging effects so far have been on the trans-Atlantic relationship. The community of North American and European nations forming the nucleus of the alliance that won the Cold War for the West is closer to breaking up now than any time since the 1940s.” (“Why Trump clashes with Europe,” by Walter Russell Mead, WSJ, 6/12). The summit of the G7 nations, meeting in Quebec just a few days ago, ended in disarray when the US president refused to sign the joint communiqué and walked out of the conference. The future of the organization remains in doubt. The G7 was sometimes referred to last week as the G6+1; at other times the G4, as only the European countries seemed to be in agreement. By throwing out the suggestion that all tariffs be abolished, Mr. Trump was undermining the very foundations of the European Union. Early in July, the US president will be attending the NATO summit in Brussels. It should become clearer then if he feels any support for the European democracies. If he doesn’t, Europe will be on its own. “Germany’s foreign minister called for the European Union to become a more self-confident global actor, prepared to take counter-measures when the United States crosses “red lines” and able to respond to Russian threats and Chinese growth. “In a Berlin speech, Heiko Maas gave the clearest sign yet that Germany no longer sees its 70-year-old alliance with the United States as unconditional, and threw his weight behind French proposals to make the EU shipshape for a more uncertain world. “In remarks that drew a line under the post-war German doctrine of close alignment with the United States, Maas listed President Donald Trump’s Washington as a challenge for Europe, alongside more traditional rivals like Russia and China. “The speech is the latest in a flurry of declarations by leading German politicians digesting the implications of the disarray following Trump’s abrupt departure last week from the Quebec G7 summit, long a pillar of the US-led Western global order. “Earlier this week, German Chancellor Angela Merkel, long known as among Germany’s most committed Atlanticists, effectively demoted the US relationship in a television interview by saying Germany’s second loyalty had to be the EU. Once again, money has played a part in Mr. Trump’s anti-European rhetoric. Although some European countries do spend more than the required 2% of their GNP on defense, some do not, including Germany. Mr. Trump feels very strongly that this is wrong and needs to change. The United States is deeply in debt. In itself, this poses a grave threat to national security. Other nations must devote more of their resources to defense. Did both the Singapore and the Quebec summits have a lot to do with money? Seemingly so. Seventy years after the formation of NATO, could the organization break up? We will see next month.